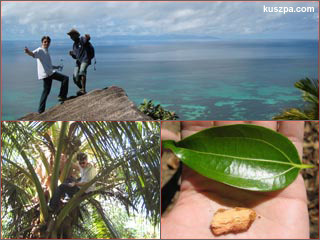 Me on a palm, me with our guide and cinnamon plant. The hotel offered a guided walking-tour today, so I spontaneously joined a small group and walked along the on-site nature trail. During this two hour walking-tour we learned about the flora and fauna of Praslin and had a great panoramic view on the surrounding bay area and islands. At the end I had the possibility to climbed a palm and get a coconut which we ate up.